It might not look much different, but there's been a lot of work over the past few weeks. On the left of the pic are two 8x4 worktables sitting on 4 sawhorses I knocked together. 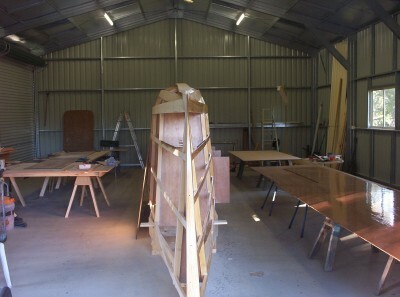 This is the work surface I'm using to scarf together the plywood for the hulls. The hull frame is faired, sanded and 1/2 painted with epoxy and tomorrow we'll be attaching the inboard ply sheets. 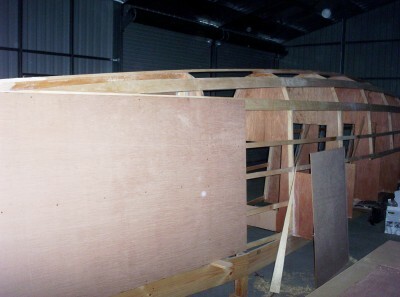 Down the right side are several bits of ply at various stages. The shed also now has power and lights, which makes it much easier to work mornings and evenings now the days are getting shorter. The new transom is in place, and most of the frame is faired ready for sheeting. The photo shows the first sheet temporarily in place to check fairing of the bow. I'm trying to get the fairing as good as I can at this stage - which will hopefully reduce the amount of fill and sanding needed after the hull is glassed.